Experience the real pumpkin patch. This is our 23rd season where you can get all your fall decorations from the field. 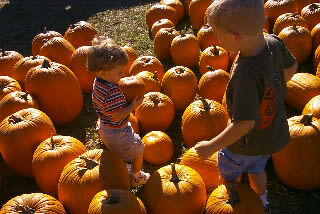 Via your tractor drawn wagon ride to the pumpkin patch, pic your own pumpkin right off the vine. Choose your Chrysanthemums from thousands grown on the farm. Enjoy children's activities: the barnyard bounce, pumpkin painting, playing in the hay and feeding the chickens. The Kitchen offers home cooked meals and treats and jars of farm produce transformed into jars and jams, jellies ad relishes. Get all your fall decorations fresh from the field and pick your pumpkin right off the vine. We offer hayrides and activities such as pumpkin painting and a corn maze. Open: Sept. 28 through Oct. 31,2019. M-F 3-6 p.m.; Sa 10 a.m.-6 p.m.; Su 1-5 p.m.